So the head of research at CERN (Conseil Européen pour la Recherche Nucléaire, or, European Organization for Nuclear Research), the world renowned particle physics lab located on the outskirts of Geneva, Switzerland, makes a phone call. He calls downtown and chats with the head of research at Rolex. The Milgauss was the result. Now… there’s really no evidence this particular conversation actually took place, but legend has it that a request did come to Rolex from CERN about making a watch that could withstand intense magnetic fields. The Milgauss is a tool watch, like many in the Rolex lineup. But it’s such a specialized tool that it’s probably worn more by fans and collectors than those who truly require their watches to resist intense magnetic fields. The name comes from the watch’s ability to withstand a magnetic field of 1000 gauss and keep functioning properly (the prefix mil- means 1000 and a gauss is a magnetic field measurement unit). To gain this level of resistance, the movement is protected by what’s called a “Faraday” cage, a soft iron inner case which surrounds the movement and protects it from stray magnetic fields. This makes the Milgauss bulkier than a typical watch, but that only brings it in line with modern fashion sensibilities. Rolex introduced the Milgauss in 1954, around the same time they introduced the Submariner and the Explorer. Early examples sported dauphine hands and the now-familiar lightning bolt sweep second hand. They looked more like Submariners, rotating bezels and all, than the now-familiar Explorer- or Datejust-like configuration. Now it’s important to note that Patek Philippe, IWC, Omega, and Blancpain had also noticed the niche need for an anti-magnetic watch. They’d already introduced such watches of their own, the Amagnetic, the Ingeneur, the Railmaster, and the Fifty Fathoms Milspec 11, respectively. All used the principles of the Faraday cage. However, this proliferation of watches was quickly over-filling the micro-niche. Too much supply and not enough demand. Patek Philippe and Blancpain soon dropped out. And by the early 1960s, Rolex had redesigned the Milgauss to individualize it. Among other things, they removed the rotating bezel to distinguish it further from the Submariner. A few years later, the Milgauss was still in the Rolex catalog, but only available by special order. The waiting time was indeterminate. Rolex simply waited until they had enough orders to make a production run worthwhile. 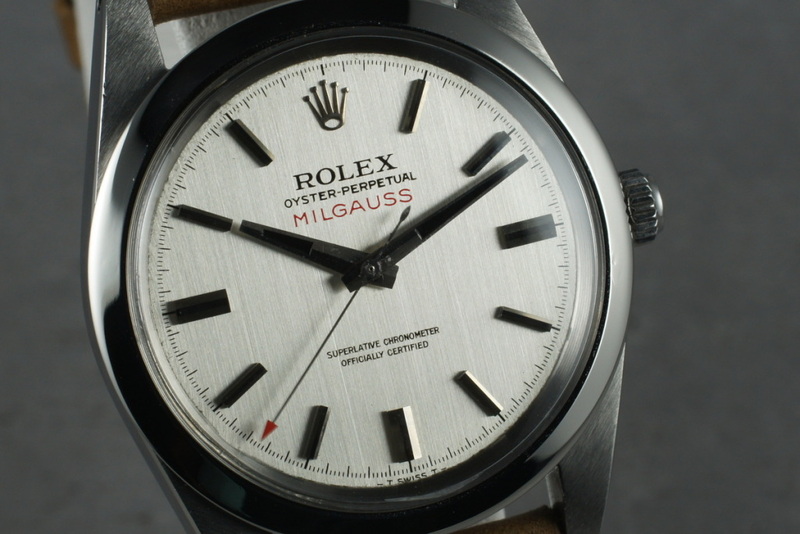 The Milgauss remained on the Rolex roster until 1986. However, production had been discontinued a couple of years earlier. As the watch was never made in large numbers, early examples are very desirable collector’s pieces today. In 2007, the Milgauss was resurrected, again looking like a beefier version of the Datejust (due to its internal shielding), and complete with lightning bolt sweep second hand, choice of white, blue, or black dial, and an optional green tinted crystal with the blue dial. The resistance to this new version is helped by the new “Parachrom Bleu” non-magnetic hairspring. We’re betting uniqueness is driving current sales as much as is the need for a highly anti-magnetic timepiece. Ever wonder about the backstory of your favorite Rolex? Well, stick with us. This is the fourth in a series of posts featuring histories of significant Rolex models. You’ll find all the reference numbers connected with each model here. In all, Rolex has introduced nearly three dozen models since 1950. So far, we’ve covered the Datejust, the Day-Date, and the Explorer. Over the next several weeks, we’ll touch on each of the rest.